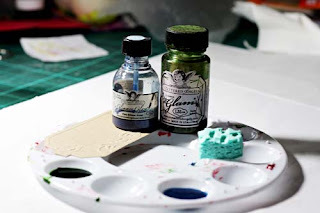 My latest Fabulous Find are 2 new products by Tattered Angels - Glimmer Glaze and Glimmer Glam. Like the other Tattered Angels products that we all love like the Glimmer Mists and the Glimmer Screens, these products are equally shimmery and easy to use! 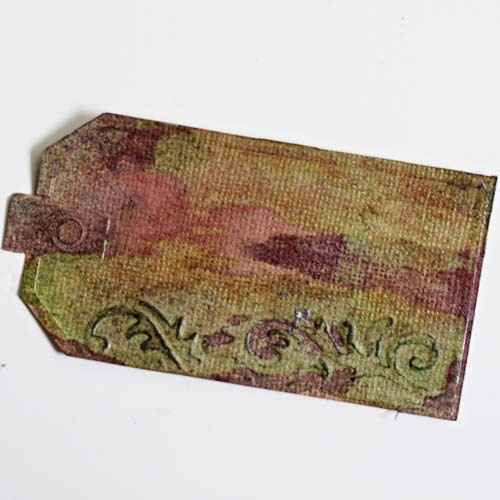 Let me show you how to create an interesting tag shown below using the Glimmer Glam and Glaze. 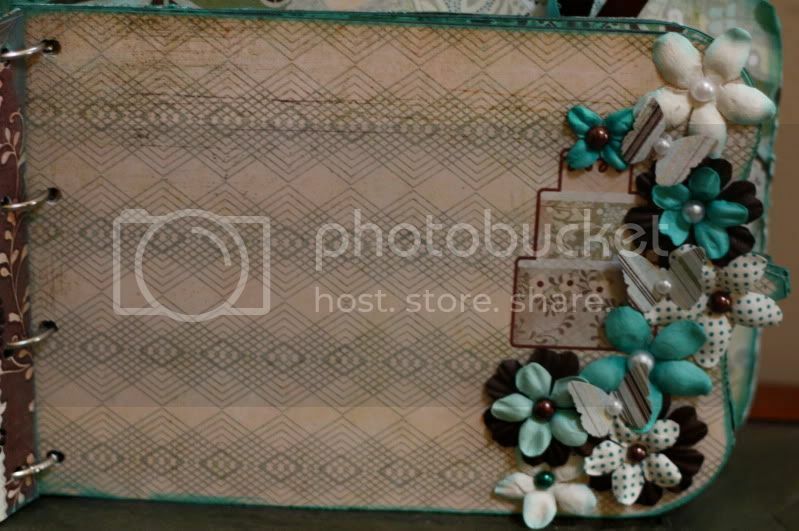 Start with a tray or use your Tim Holtz mat or a discarded yogurt tin. Pour in about 1 tsp of the Glimmer Glam and in another discarded yogurt tin, pour about 1 tsp of the Glimmer Glaze into it. 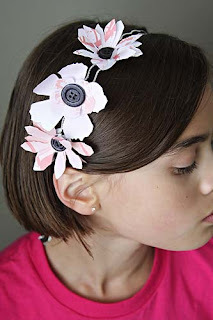 It is very easy to apply the Glam and Glaze using a dollar store sponge (cut up into 1" cubes) or even easier, some crumpled up wax paper, yes, wax paper! 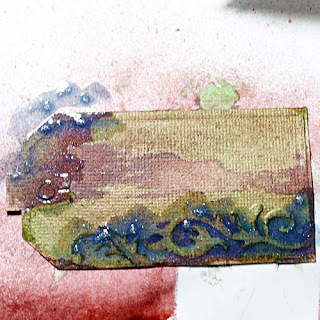 Using either a crumpled piece of wax paper or the sponge, randomly dab on the GLAM to the tag. Then spray the GLAM-med tag with some glimmer MIST. Notice how the MIST beads up on the GLAM? That is because the GLAM is resisting the MIST. You could also apply the GLAZE on the GLAM too, if you wanted! 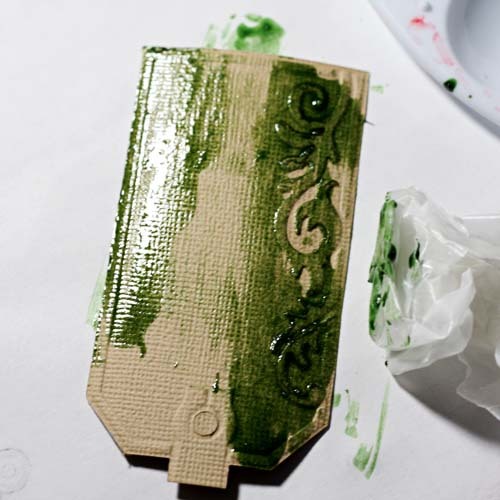 After the MIST-ed and GLAM-med tag dries, apply some GLAZE in the embossed areas and on the edges. The GLAZE helps define the embossing and accents the edges of the tag. If you want the GLAZE to be a predominant colour, let it dry fully. If you prefer a sheer-er look, dab off some of the GLAZE. Voila! An interesting tag to adorn a present for a special someone! I hope you will show me some of your projects too! I'd love to see some more... make sure you drop by the forum and share your work with us! We are SO in for a treat this Fabulous Friday! The talented Erica has an Inspired By Challenge for us to savour and enjoy! I don't know about the rest of you, but I'm a bit of a magazine junkie ... and not just scrapbook ones either. I have a weird habit too of tearing pages out of magazines too for recipes, cool projects and ads that scream SCRAPLIFT ME! I keep them all in a binder by category and one category I have is inspiration ads. Here's one that that I found a couple of years ago. I think I was going through a circle phase and loved all the big dots, I also loved the linear look to the page and how every circle was filled with a picture or set of words. See where I'm going with this? Well, I finally pulled it out of the binder and scrapped it. And here's what I came up with. My circles are a bit bigger, some are photos, others are patterned paper and then embellished. 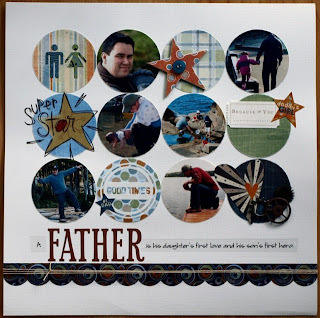 I had to lose a row of circles for space because my circles are so much bigger, but it meant that I had more space to play with and the photos are easier to see the subjects in. 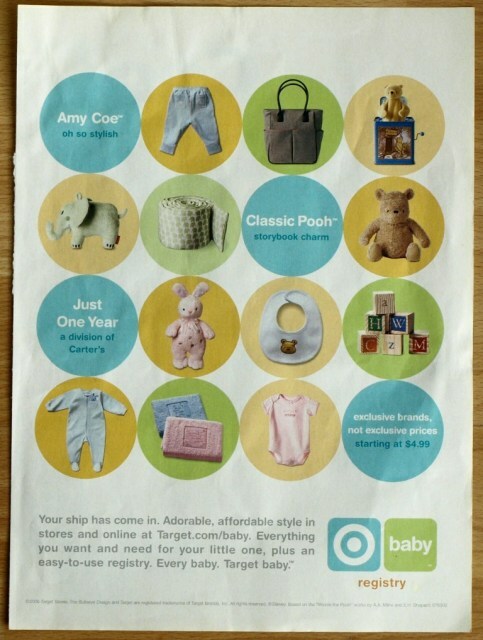 I love how it turned out and I hope that it either inspires you to create your own page based on this ad, or to pull out your own ad to scraplift. Happy Scrapping! I used Fancy Pants Like Father Like Son papers and stickers which are available in the store and lots of other goodies from my stash. Thank you Erica for the fabulous challenge! Our card crew is back at it and once again we have not been disappointed! 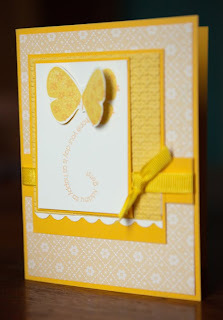 Here are Jennifer R's cards for this weeks challenge.... gorgeous work Jennifer!!! It can't be Anything But Friday here at Scrap Shotz!!!! Yes, our lovely Lizette has an Anything But challenge for us to kick off the weekend! 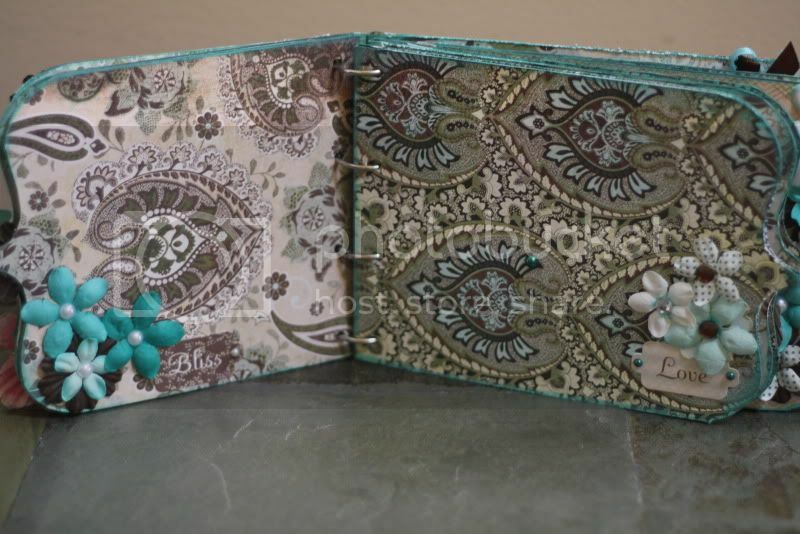 MINI AlBUMS- the perfect coffee table accent, the perfect gift for that special someone, the perfect way to use up your stash! Someone once asked me it must be hard to make a mini album. My answer is NO, it is a lot of fun and at times a quick project. Get started by picking the size and shape of the album. You can make your own covers or like I did buy one! And create your mini album by using the same methods, and steps you use creating a LO or card. 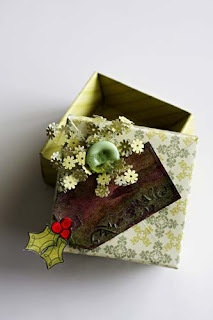 A mini album is also a way to use new techniques that you may want to try but haven't had the chance, like painting, paper piecing, embossing, etc. It can also be an purge outlet. Mix and mach those two flowers or bling left from a pack or those odds ends of the beautiful papers ribbons and so on and so fort. 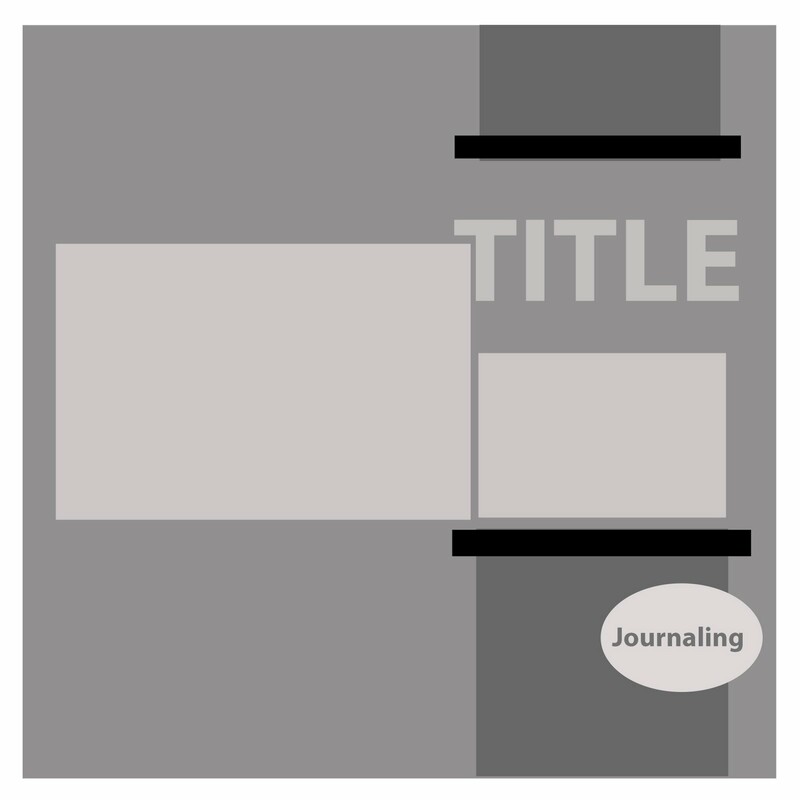 My challenge to you is to make a mini album. Thanks for sharing your beautiful mini album with us Lizette!!! Happy a wonderful scrappy weekend! In the past I have not used alot of the Tim Holtz products. It isn't that I don't like them because I do! 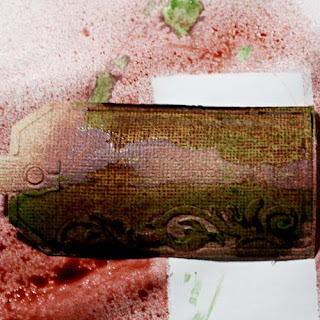 I am in awe of Tim Holtz and the talent that just oozes out of his pores. 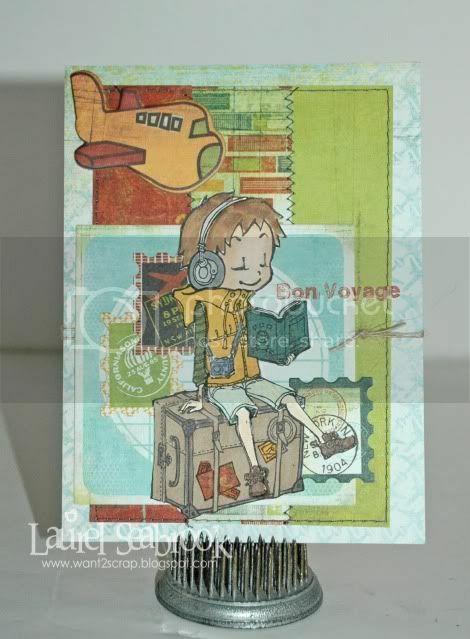 But I am not a grungy/distressed type of scrapper so I am kinda at a loss with what to do with the products. This was until I caved and purchased the Tattered Florals Die! If you knew me, you would know that my Big Shot is in a lovely doctor's bag, placed ever so carefully on the floor of my closet, rarely used. But there was something about the die that made dig out my Big Shot. After a big of fiddling around, I made these for my girls to celebrate the start of school. They loved them and still wear them! 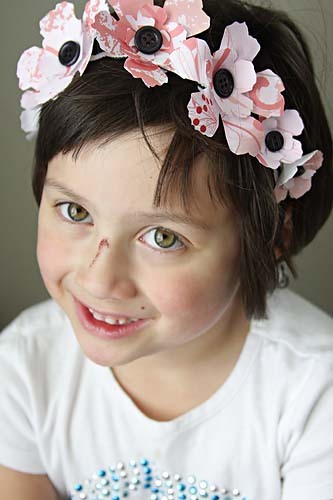 Here we have the "tiara style" for a Princess-in-Waiting! And a more refined look for the "Middle-Schooler!" 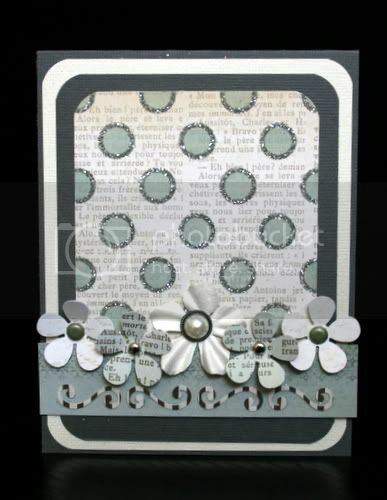 I made my flowers dimensional but these flowers look amazing flat in layouts and on cards. So give it a go! 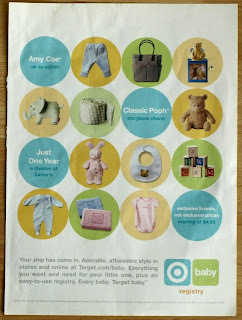 You can purchase them from Sandy through a pre-order - just drop her a quick email! She is speedy and has the best customer service! Oh and let me know what you made with yours! Erica (MamaPod) uploaded this fabulous card last week.... that sentiment is classic!!! LOL Thanks for the great card challenge Erica! For today’s Chromatherapy challenge, I’m going to ask you to step out of your comfort zone. That’s what a challenge is all about, right? Let’s think for a minute – what colour is the most difficult for you to work with? What colour do you avoid? For me, it’s yellow. 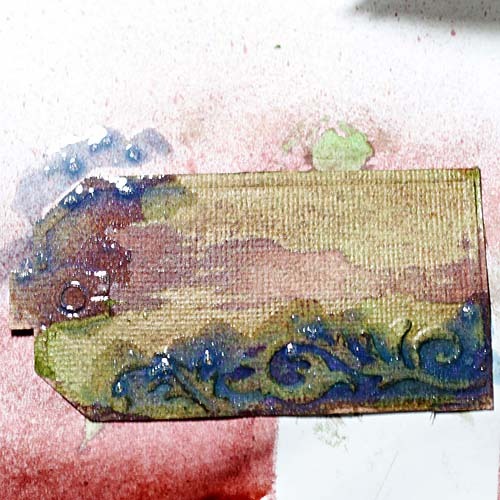 I love the colour, but I rarely include it on my cards and layouts and I don’t know why. It’s bright and sunny and summery. This was turning into a challenge for me too. 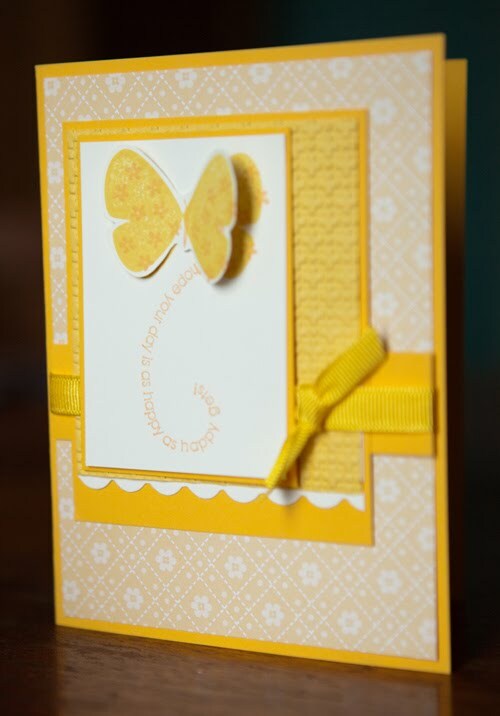 Take that colour that you rarely use, (or even don’t like) and make a card or incorporate it as the main colour in a layout! Let’s see what you can do! Please contact Sandy to make arrangements for your contest prize! I just could not resist this one! I can just hear that little guy laughing.out.loud! Thanks for uploading Lorraine! Do you know what day it is today? Yes, it is the Friday before the Labour Day Weekend but it is ALSO Fabulous Friday here at Scrap Shotz. 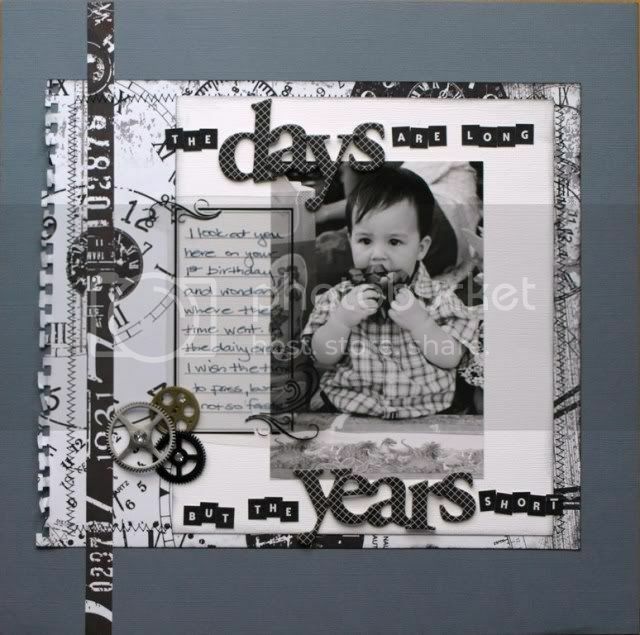 This Friday, our lovely Denise has prepared a blueprint challenge for everyone. I am SO glad it is a long weekend so I can give it a whirl! And here is Denise's interpretation! Oh oh oh oh!!!! It's Reveal Day at Scrap Shotz and the Design Team has completely outdone themselves! Here is a gem from Jen! 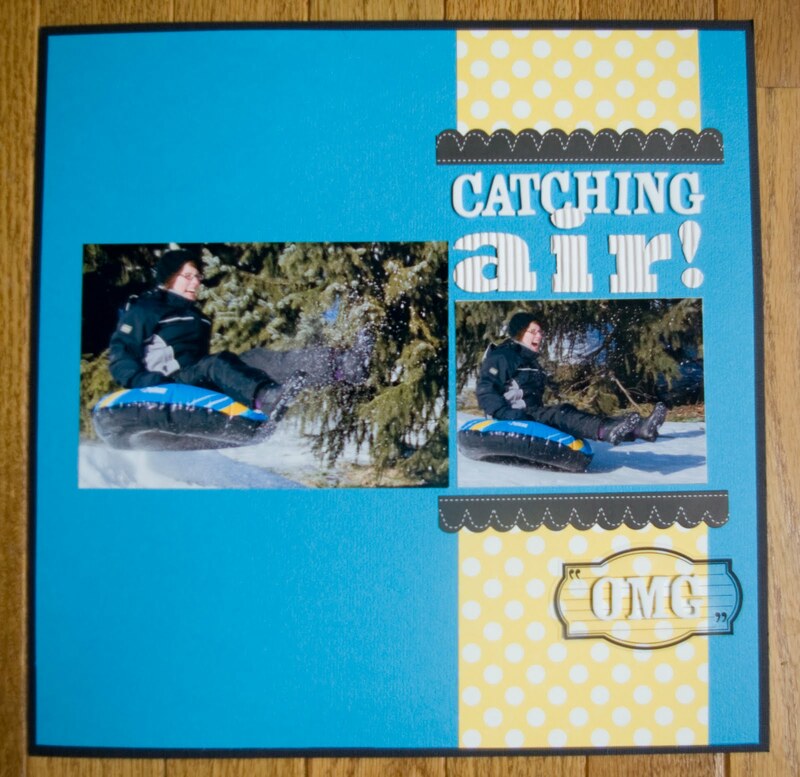 And look at this layout from Denise! 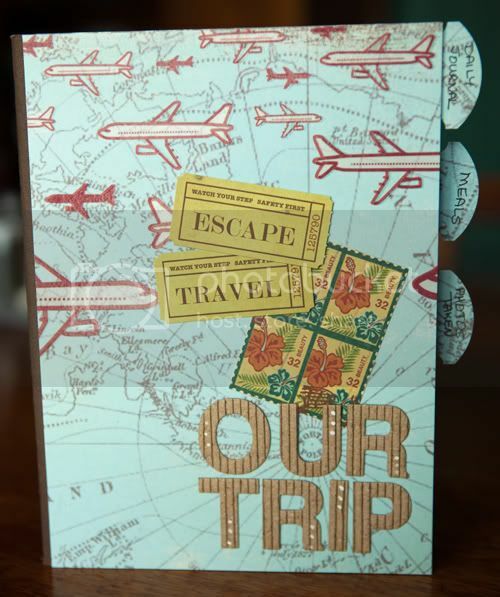 Love this travel journal from Stephanie! And how about this sweet card from Laurel??? I think you will agree that the team has truly outdone itself! 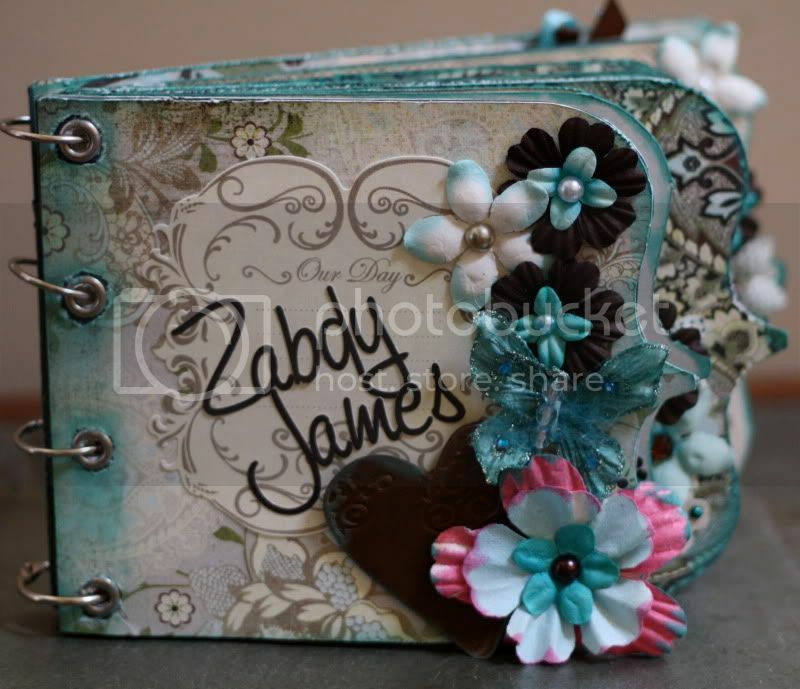 Stay tuned for next month as the luscious Scrap Shotz kits return!